Scepticism about media, politics and finances comes naturally to most of us these days, particularly when people who should know better have brought the world to a state of economic crisis (did our rulers really not know that unfettered greed is no basis for an economic world-order?). It is refreshing to read a book like Don’t Get Fooled Again, which takes our vague feeling that “things aren’t quite right” and shows us that gut instincts are often quite correct, and we really shouldn’t believe the utterances of any institution or public figure without first submitting them to some pretty stringent tests. Richard Wilson puts forward a good case for scepticism, reminding his readers that humanity has a long history of “meekly engaging in depraved acts of inhumanity on the basis of ideas that turned out to be total gibberish”. Much of his book focuses on the public relations industry, citing a number of case studies to show how opinion can be manipulated. 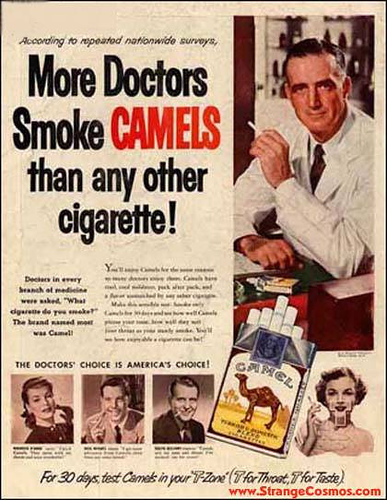 He devotes a whole chapter to the way tobacco companies in the 1950s manipulated news organisations to question the increasingly obvious link between smoking and lung cancer. The strategy consisted of getting an influential academic on-side (geneticist Clarence Cook Little in this case), and using him to question every scrap of evidence which research scientists gathered supporting the need for anti-smoking legislation. Little insisted that it was not enough to show that lung cancer victims were smokers, but that until the cause of the link could be demonstrated under laboratory conditions, the link was irrelevant. Tests showing that mice contracted cancer when exposed to cigarette smoke were contested, but on the other hand, animal tests which were favourable to the tobacco industry were heavily publicised. Wilson shows that genius of the PR campaign was capitalising on the media’s love of “debate”. A story really takes off when two sides are seen in opposition, even when it is obvious that the alleged “controversy” is falsely based. This can be observed every day on programmes like BBC Radio 4’s Today programme, when even the most blindingly obvious truth has to be contested by a protagonist with opposing views, with the result that equal weight is given to both nonsense and fact. One million people walked the streets of London to protest about the US/GB invasion of Iraq but this had no effect on those who wanted for a variety of reasons to believe the fantastic reports about Iraq’s offensive capability. Wilson warns of the dangers of pseudo-science, and its ability to influence government and other decision-makers. Wilson traces this back to Trofim Lysenko, Stalin’s favorite scientist who’s wrong-headed ideas about agronomy led to mass starvation throughout Russia. Even worse, Lysenko’s ideas were taken up by Chairman Mao and his followers whose Lysenko-inspired agrarian reforms led to the worst man-made famine in history, with the loss of 30 million lives. The illusion of unanimity among group members with silence being viewed as agreement. I have worked on many large I.T. projects and have seen these processes at work when projects have begun to fail and careers and reputations are at risk. Project teams easily acquire the need to plough on despite all warning signals to the contrary until finally the project is abandoned far too late for anyone to be able to recover any benefits from it. Wilson goes on to consider the HIV/AIDS denial movement, begun in America and then influencing the thinking of the South African government where “AIDS dissidents” have had a malign effect on public policy leading to the denial of effective treatment for many. President Tabo Mbeki immersed himself in AIDS denial literature and invited American AIDS dissidents to join a presidential advisory panel on AIDS and HIV, one of whose aims was to inivestigate “whether there’s this thing called AIDS . . . whether HIV leads to AIDS, whether there’s something called HIV”. By 2005, more than 5.5 million South Africans were infected with HIV and 1000 were dying each day from AIDS. In his concluding chapter, Richard Wilson lists the common threads which run through false and illusory belief systems: fundamentalism, relativism, conspiracy theories, pseudo-scholarship, pseudo-news, wishful thinking, over-idealisation, demonisation of perceived enemies, groupthink. While many of the ideas in this book are nothing new in themselves, Wilson has gathered them together, with many fascinating examples from recent history, to provide a very useful handbook for people who know that things they read in the paper or hear on the television are “not quite right” and need to be challenged. I was pleased to find that Richard Wilson has a blog Don’t Get Fooled Again in which he reports on many of the topics covered in his book.